One of our favorite 'quickie dinners' is a frittata. Thanks to the CSA, we've had plenty of eggs lately. And on Sunday when we grilled chicken for dinner, SP also grilled some red peppers, so we have a container of roasted red peppers. 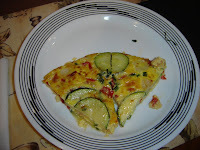 Last night we made a roasted red pepper, zucchini, and cheddar cheese frittata, with parmesan and chives sprinkled on top. Delicious. And so easy, much easier than regular omelets or quiche or even scrambled eggs (well, we think so! ).